Hearts striker Conor Sammon concedes the high-profile capture of Kyle Lafferty has ushered him closer to the Tynecastle exit door. The 30-year-old was one of the Jambos’ marquee signings last summer under former head coach Robbie Neilson, sealing a three-year deal following his release by Derby. However, Sammon toiled for form and, following a meagre return of one goals in 19 games, he was farmed out on loan to his old stomping ground of Kilmarnock, where he saw out the campaign and found the net five times. 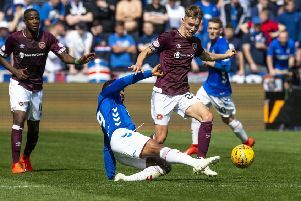 The Republic of Ireland international was back in maroon on Saturday, entering the fray at the Tony Macaroni Arena in the second half to help Ian Cathro’s side claim a 1-0 win over Livingston in their first official pre-season friendly. Nevertheless, barring a dramatic change in circumstances, it is likely to be a temporary reprieve for Sammon, who accepts that his future probably lies elsewhere after falling behind Lafferty, Isma Goncalves, Cole Stockton, Bjorn Johnsen and Rory Currie in the pecking order. Asked whether the arrival of Lafferty will make his exit more likely, Sammon said: “Yes, I would think so. The club have signed Kyle, who is obviously another good centre-forward and I’d guess that would limit my opportunities here. “I think there is a good chance I will need to look elsewhere to get that run of games that I need at this stage of my career. I don’t want to be playing third or fourth fiddle to anyone. I’ll have to wait and see what happens over the next few weeks because I’m sure there are a lot of transfers to be done, and I’m at a stage where I want to play games. I’ll keep training hard and keep working hard and see what comes. I went on loan towards the end of last season and it was brilliant for me, very enjoyable and you want to be testing yourself week-in, week-out. The situation is a disappointment for Sammon, pictured, who, despite an underwhelming maiden season in Gorgie, remains convinced he could make an impact at Hearts. Instead, he will seek to prove a point at his next destination. “It’s all about the manager’s decision. He has his own thoughts, ideas and plans for this season and the future,” continued Sammon. Killie have been credited with a desire to bring Sammon back to Rugby Park for a third stint. The former Derry, Wigan and Sheffield United man was a positive influence on and off the pitch during their revival under Lee McCulloch in the second half of last season. Sammon has confirmed that, should he leave Hearts, he wants to remain north of the border. Only a fine save by Livi goalkeeper Gary Maley stopped Sammon from getting his name on the scoresheet on Saturday, while Euan Henderson and Ally Roy also came close to adding deserved gloss to a satisfying Hearts win. However, Cole Stockton’s first-half strike – converting from close range following a fine sweeping move that resulted in a perfect Rory Currie pass for the debutant – was enough to secure the triumph.